The United States hopes that a combination of trade and infrastructure can help steer Afghanistan away from unrest – and Russia. The United States has launched a new strategy for Afghanistan’s economic development, aimed at making the war-torn country a hub of commerce rather than of religious extremism and strife. The plan is visionary, but turning it into reality will require political will that it’s not clear the United States, or Afghanistan’s neighbors, are willing to show. The metaphor of a “New Silk Road” has become a trope of Central Asia policy ever since the collapse of the Soviet Union gave these countries their independence, and the opportunities to forge their own foreign and trade policies. But this particular vision originated with S. Frederick Starr, a Washington-based scholar of the region and chairman of the Central Asia-Caucasus Institute at Johns Hopkins University. The plan was picked up by officers at U.S. Central Command, led then by Gen. David Petraeus, who saw it as a way to build long-term stability in Afghanistan. The plan also dovetails nicely with a broader U.S. project to wean these countries away from their economic and political ties to Russia. 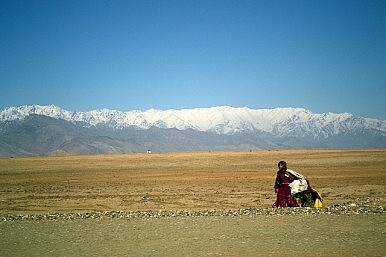 The United States has already sponsored projects to tie the electricity networks in Central Asia to those in South Asia, and in a bureaucratic but pointed move, reorganized the regional bureaus in the State Department so that Central Asia was grouped with South Asia, rather than with Russia and the rest of the former Soviet Union. In their public statements on the plan, U.S. officials have cited a handful of current or potential projects that the New Silk Road would build on, including an Afghanistan-Pakistan free trade agreement, a U.S. government sponsored project to transmit electricity from hydropower plants in Central Asia to Afghanistan, and a pipeline that would ship natural gas from Turkmenistan to India via Afghanistan and Pakistan. In total, the U.S. government has identified 30 to 40 infrastructure projects that it sees as potential elements of the New Silk Road. But those are hardly firm foundations on which to build Afghanistan’s economic future. The Turkmenistan-India pipeline, known as TAPI, along with similar proposals, have been discussed for years, but have never reached fruition. That’s in part because of political difficulties between India and Pakistan, but also in part because no large company with the capacity to build such a pipeline wants to take the risk of operating in Afghanistan for the next several decades it would take to make the pipeline profitable. With the U.S. starting to withdraw from Afghanistan, that problem will only become more intimidating.